I’m sorry to report that I’ll be stepping aside from the KingstonCitizens.org blog for the time being. Of course we’ll keep the site up and running. In fact, KingstonCitizens.org founder Rebecca Martin is looking for more bloggers to report on city events. If you’re interested, contact her at: info@kingstoncitizens.org. There’s a new service from the New York Department of Transportation that just launched, which gives motorists and commuters a quick update on traffic conditions and more via a website and free phone call. People can just dial “511” for an update on traffic and transit conditions. Or, check out the website, http://www.511ny.org, for more detailed information. The website also has information on ride shares and includes a transit trip planner. There’s also useful links to tourism, airport and biking websites. 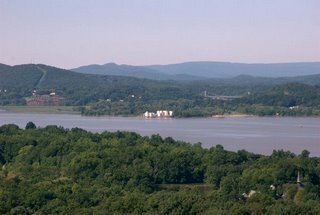 Last week a group of hikers were led on a short trip through Ferncliff Forest in nearby Rhinebeck by environmental educators from Forsyth Nature Center that culminated with a spectacular view of the Hudson River and Kingston from atop an observation tower. The hike was part of a series of adult hikes that starts at the nature center every other week. Check out the program calendar on FNC’s website here for more information. The observation tower at the preserve, which is owned by the Rotary Club, was recently rebuilt. Read more about the tower in this article. As the City of Kingston explores options to separate outdated combined sewage outflow lines, officials may want to consider including a broader storm water mitigation plan that involves installing rain barrels for homes, schools, businesses, hospitals and municipal buildings. Why? Well, the benefits are enormous, and include reducing the volume of water that has to be treated. More importantly, capturing rain water keeps it from flowing into storm water drains along with road salts, oils and other contaminants on our city roads. And not only does this make our streams and rivers much less polluted, but capturing water reduces flooding. This past Saturday at the Forsyth Nature Center, Steve Noble, environmental educator, gave a workshop on rain barrels and how easy it is to install one. The barrels cost about $100, and the water captured can be used to wash your car, water your garden and water your plants. Steve said during the summer months, a rain barrel can save a homeowner about 1,300 gallons of water. If the city were to implement a rain barrel pilot program, say with 500 barrels installed, more than 650,000 gallons of water could be diverted — which saves money in water treatment costs and reduces pollutants as well as flooding. Worth considering? And as this prior post points out, there could even be a cottage industry here in harvesting rain. * Don’t cut your lawn grass low. Higher grass needs less water. * Fix dripping faucets, which can waste 54 gallons per month. * Turn of the faucet while shaving, washing, brushing teeth and washing dishes. Interested in buying a rain barrel? Check out the benefits here. To purchase one, see Gaiam or check this page out. Kingston’s Joshua and Jessica Applestone, who Fleisher’s Grass-fed and Organic Meats on Wall Street, made the cut in a story about hip, rock-star butchers in today’s The New York Times. Check out the story, here. 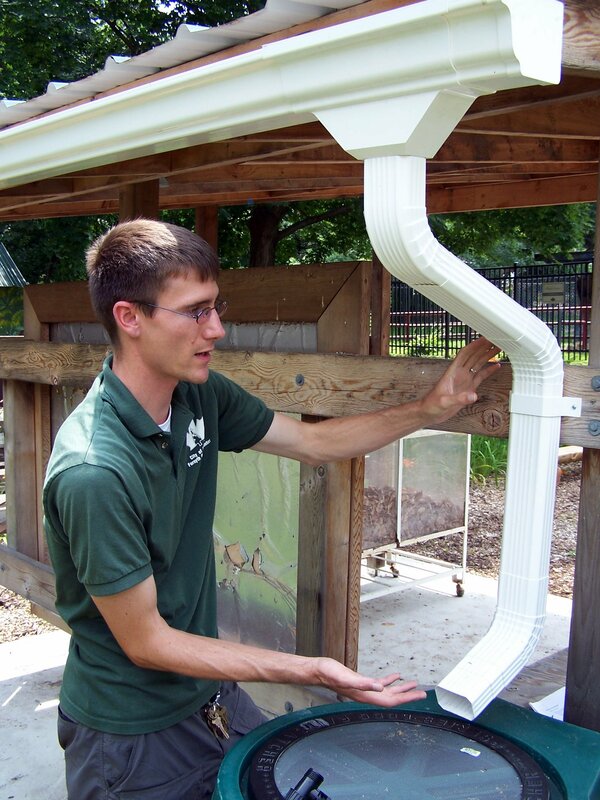 Harvesting Rainwater: A Potential Local, Green Industry for Kingston? In today’s Freeman (Nation/World, page B2) there is an interesting article from the AP on the first national ordinance for rainwater harvesting on commercial projects in Tucson, AZ. Half of the water supply necessary for landscaping for new business and corporate or commercial structures will need to be harvested beginning next year. Kingston environmental educator Steve Noble and Mayor Sottile have been in discussions for some time (on the subject of Kingston’s storm water issues). There are other important community leaders and public officials providing helpful information on what to do, too. How about some ideas and advice from the great minds of our residents? (Bring this subject to your Yahoo! Discussion group to flesh out the subject). With the recent debate of the city of Kingston taking a ‘green pledge’ to work towards more local, green jobs for our community – could harvesting our own rainwater help to provide a savings of resources and tax dollars while providing sustainable new jobs for Kingstonians? What is clear is that if we don’t figure out some sort of solution for our current storm water/raw sewage problem the city is likely to be fined upwards of $37,500 a day by the DEC. “The problem of sewage getting into the Rondout Creek has long been an issue in the city, where some sewer pipes handle a combination of storm and waste water. During periods of heavy rain, the city’s sewage treatment plant cannot handle the flow, and the overflow goes into the creek. Some pipes overflow directly into the creek.” (Taken from the Daily Freeman. The article in full is attached below).